There is often an essential need for mobile music-making and we’re not just talking about the whimsical passing of time on the daily commute. Producers, and musicians of all kinds, rely on certain apps to get those initial ideas down. For many, it’s the start of the creative process and with busy schedules, getting those early ideas down on-the-go is extremely important. 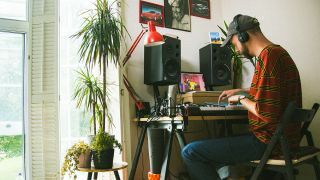 Finding apps that work for you in such vast open sea of drum machines, synths and other iOS groove-makers, can be a bit of a daunting task - it’s really hard to know which ones will work for you until you’ve tried them at great length. What most of us will agree on is that getting those ideas down fast is key. Another major consideration is that those initial ideas need to be unique; both creative and rammed with content. Understanding the importance of musical creativity on iOS, both Novation and Focusrite set about to create a brand new Innovation start-up called Ampify. Home to some well-established iOS apps, including Launchpad, Blocs Wave and more recently Groovebox, with the sole intention of redefining music making in a mobile world. The Launchpad app is perfect for making and remixing music. It is one of the most successful apps in the whole of the App Store (over eight million downloads, nearly a million active users) and has complete integration with the Novation Launchpad and Launchkey hardware (although not necessary, app works standalone of course). Blocs Wave is an app for create and recording ideas, which has a unique Discover mode to make new tunes from scratch, also features a very powerful tool when it comes to building ideas, with the real-time loop recording functionality. Groovebox is a beats and synths music studio, and has easy to use synthesizers with a vast patterns library, getting users up and running immediately and just like Blocs Wave and Launchpad, Groovebox is free, with more content available as In-App purchases. The beauty of each of the Ampify apps is that they will work for beginners, pros and anyone in the middle. If you’re just getting started, or serious about making music then Launchpad, Blocs Wave and Groovebox all have something to help you make your initial musical sketches quickly, building the essence of a track. Once Ideas are made it’s easy to export to other software, such as Ableton Live with the Live Export function. For more information go to the Ampify website where you can download all three apps for free, with more content and pro-level features available as In-App purchases.